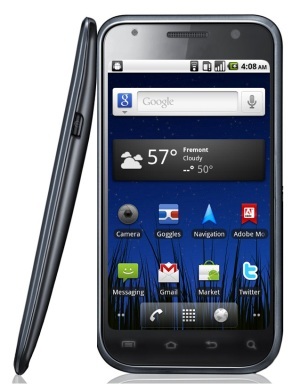 Gizmodo reports that Samsung is releasing the Nexus Two, a spiritual successor to Google’s do-it-yourself Nexus One Android phone. Oddly, the new device resembles a Samsung Galaxy S phone more than the original Google Phone, but does retain the pure Google Android experience of the Nexus One. The Nexus Two has a 4-inch AMOLED screen, similar to the Galaxy S series. The device also has a front-facing camera, which should start popping up in most new Android phones. (Apple made front-facing cameras a selling feature when it added the feature to its iPhone 4.) It will likely run on Gingerbread–the next version of Android. Rumors indicate that Google may add a number of visual and functional enhancements to the upcoming OS including video chat. Unlike the HTC-built Nexus One, the Samsung-built Nexus Two doesn’t appear to be pushing processing speeds, or any hardware stats, to a new level. The device is comparable to other Android phones, but is not a powerhouse like the Nexus One was at its release. It is unknown whether Google will get Verizon or another wireless carrier to sell the Nexus Two or if the search company will sell the device on its own, as it did with the Nexus One. Because Android is an open source operating system, many phone manufacturers choose to add their own flair to the standard Google Android experience. Motorola, Samsung, and HTC each fiddle around with the design of the OS, modifying menus and adding slicker graphics to replace Google’s own. The results are sometimes pretty, but may damage the Android ecosystem. Imagine if each copy of Windows was slightly different and had menus in new places? Would you be able to help your friend set up an Internet network if all the settings were in a new place? It wouldn’t be easy. By releasing more Nexus devices, Google can show users what the actual Android OS is like. Hopefully other manufacturers will take notice.